When flying out of the US, many of the passenger costs are subsidized by the government. However in Canada, we have some of the highest airport taxes in the world. We’re on the hook for fuel surcharges, airport fees, improvement fees, government fees, duties and sales tax, whenever we fly. It should come as no surprise that many Canadians are heading south of the border to fly to save money on airfare. Depending on which Canadian city you’re travelling from, it may actually be faster and more convenient to fly out of the US. Of course, price will always be the biggest factor ,so consider the following, before making your decision. USAirline fees: Cheaper airfares are the main reason why you would fly out of a US airport but don’t forget about the other savings. Most Canadian airlines now charge for checked baggage within North America but some US based airlines still don’t. At $25 a bag each way, a family of four could save $200 on baggage alone! Depending on the season/location, airfare can be significantly cheaper in the US but that’s not always the case. It’s important to check sites like Google Flights or Expedia to compare the cost of flying from the US versus the airport closest to home in Canada. Time to travel to US Airports: Besides costs, I consider time to be a major deciding factor when thinking about flying from the US. Driving times are easy to calculate with Google Maps; there’s even a border wait times website so you can easily figure out the exact amount of time it’ll take you to arrive. To further reduce your wait times, you could apply for a Nexus card. Many Canadians aren’t aware they only need to arrive 2 hours in advance to safely make your flight out of a US airport. Some of the airports advise only 1 hour is required, but in my opinion that’s pushing it. So although you do need to drive to the airport, your wait times are shorter in the US. Gas to Drive to US Airports: With gas prices hitting all-time lows, many travellers are now seriously considering flying out of the US. Personally, I wouldn’t worry too much about gas prices. Prices have dropped, but that’s not going to have a big financial impact. Yes it adds to your overall costs, but it shouldn’t be your deciding factor. If you do decide to fly out of the US, here’s something handy; a guide to what you can bring back to Canada from the US. Hotel Stay Near US Airports: Although getting a hotel the night before your flight is an additional cost, it can offer you peace of mind. Nothing beats a good night of rest, plus you won’t need to stress out about making it to the airport on time. Most airport hotels offer free long-term parking which will help offset the cost of your room. If you do decide to book a hotel for the night, be sure that your travel medical insurance starts the day you enter the US, not just the day you plan to fly out. A quick trip to the hospital could cost you a few hundred dollars, whereas adding an extra day to your insurance coverage will only cost a few dollars. It’s not worth the risk. Bellingham International Airport (BLI): Located just one hour away by car from Vancouver, it offers many cheap flights to the US’s West Coast and Hawaii. Las Vegas is the most popular destination out of Bellingham but if you’re willing to take a stopover, you can get pretty much anywhere in the US for a reasonable price. Note that although Allegiant Air is a discount carrier, they do charge a lot for extras. Be sure to add everything up to figure out if you’re really getting a better deal. Seattle-Tacoma International Airport (SEA): While it’s a healthy 3 hour drive from Vancouver, it’s a major international hub so there’s a good chance you’ll find a price that’s too good to pass up. 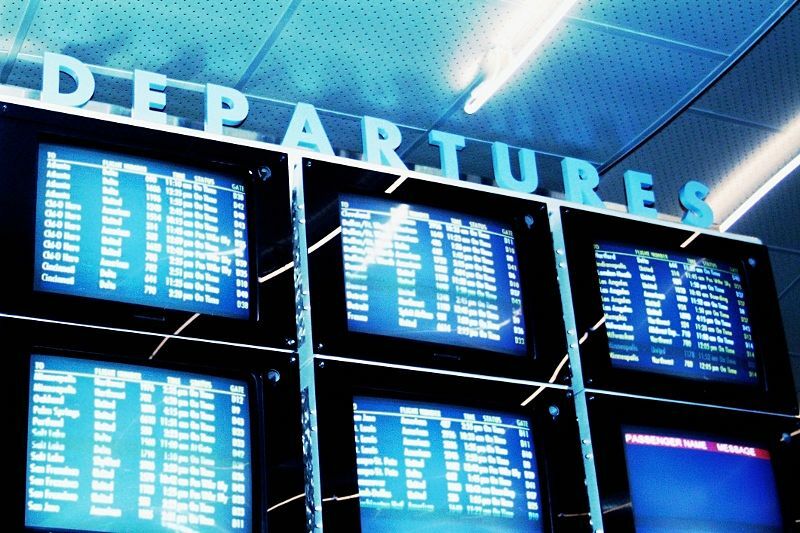 Since every major airline flies out of there, you’ll have plenty of destinations to choose from. Planning on doing some shopping? Here’s how you can safely use credit cards when travelling. Niagara Falls International Airport (IAG): Located 90 minutes from Toronto, IAG has just 2 carriers that fly to Florida. Spirit offers some ridiculously low prices, but it should be noted that they are the only 2-star airline based in the United States. Buffalo Niagara International Airport (BUF): Located 2 hours from Toronto, cheap flights from BUF are regularly available. With direct service to major US hubs including New York JFK, Atlanta and Chicago O’hare, you’ll have access to any destination you can think of with a single stopover. Ogdensburg International Airport (OGS): Currently Cape Air is the only carrier out of OGS; however in 2014, a $10 million expansion was announced, partially funded by Allegiant Air, which already operates in 98 cities. When you consider that OGS is just an hour’s drive from Ottawa, and if you take a connecting flight in Boston, there are plenty of opportunities to find a good deal. Plattsburgh International Airport (PBG): Known as “Montreal’s US Airport”, PBG is located just 75 minutes south of Montreal by car. Plattsburgh mainly serves destinations in Florida, but there are also flights to Boston and Atlantic City. Bus: Greyhound – $44 CAD return. The bus won’t take you directly to the airport, so you’ll need to catch a cab, which will cost you an additional $15-20 USD. Wherever you decide to fly, make sure you’re armed with these 5 need-to-know flyer rights, in case something doesn’t go as planned! Cross-Border Shopping- How Much Can I Bring Back to Canada? Fantastic article Barry. I used to fly out of the USA more often than I do now because now I typically fly on Aeroplan points and having a family makes it much harder to jump in a car and drive for 6 hours or more (I’m not that close to any major USA city). It can definitely be worth it though! Too bad you’re not closer to the border. Families can save a ton of money by flying out of US airports. A family of 4 could easily save $600.